Personality: After so many years like this she has developed a submissive attitude, though she is prone to bouts of stubbornness. At times she will react out of fear without meaning too if scared. Weakness: Claustrophobic, absolute silence, being trapped. Items: A deck of Tarot cards. A small lap harp. Acrobatics - Flips, cartwheels, somersaults, walking on hands, and so on. +1 CS to Agility for use. Can be applied to aid in defending rolls by unarmed characters as long as it is not a crowded or cramped situation. Performer - A juggler, dancer, singer, and more apply under this skill. +1 CS to the stat used for that skill. Bartender - Whiskey on the Rocks! Make it a double. +1 CS to reasoning ( though why this would ever be needed to be rolled for..
Sirens Call - When she sings it draws people too her, ona low enough psyche roll they are enthrawled to her forgetting whatever they were doing, only she is important and they must come to her. 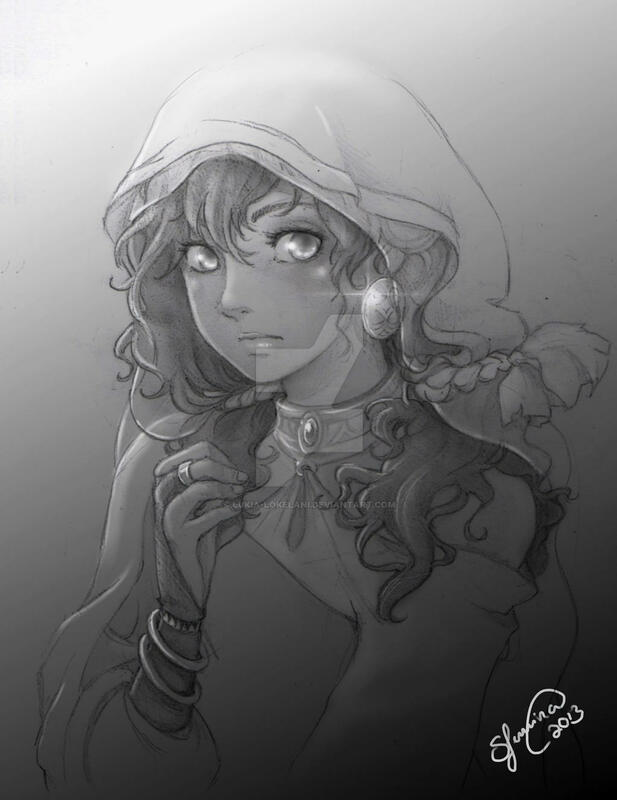 Description: Teofila has the ability to use her song to heal the wounds of others.. but at a cost. She will take the injuries onto herself to an extent to heal it. On a green roll this will take up to 15hp worth of damage onto her. On a yellow this will take up to 30hp worth of damage. Any major injuries healed during this ( bullet wounds, broken bones, bruises, and so forth ) will be taken onto her. If she so wishes she can make an endurance roll to resist up to half of the damage ( a yellow is required for this to work ). A red roll negates the need for the endurance roll. Tarot - She has the ability to read a persons future, present, or past. Only the present and past are for certain, so when she deals for the future she is given the sight of three paths for them, having them draw three cards to show. Sirens Dance - If done in battle, she can catch the eye of a 1d5 people, male or female, distracting them they will find it hard to look away from her mesmerizing movements. If done outside of battle to a single person she can cause them to fall in love with her for 1d6 hours. Description: -1 Fighting for offensive rolls to one enemy on a green roll, three on yellow, five on red. Opponents roll psyche to resist. Biography: Teofila is the child of a Siren whom was unable to keep her when she was born. She was left in the hands of a band of Gypsies who knew nothing about her birth. They knew her ears were pointed and that her eyes were strange but otherwise she looked like a normal child. So they raised her in their way of life, learning as she grew older of her powers. Most of this was harmless until she reached puberty. The head of the clan watched her as she grew more, keeping an on how her songs and dances began to draw people in and how much money they were able to make and steal from travellers when she did. So more and more they used her and she didnt notice at first because this was her family and she thought they loved her. However around the age of twenty-three she began to see how people wanted to use her powers and she became uncomfortable with it, she began to deny them. This made her clan angry the more she did it. Eventually one night they captured her and tied her hands behind her back and her feet together, locking her in a small chest while they traveled, leaving her there no matter how much she screamed, because they had lined the box to make it muffled so her powers wouldnt work on them. And so her life of servitude began. They kept her in a cage much like a pretty bird, dressed up and singing or dancing for her supper. If she refused they refused to feed her or care for her. They found ways to muffle her sounds, blocking their ears so that they couldnt hear her when she tried to fight them. For the last five years shes been there, a side show item to help them make more money, their Pretty little Bird.